Conveyor series roller chains are one of the most widely used types of chains in the world. Because of this, we stock almost every size and configuration ranging from ANSI, DIN, and ISO certified series chains. We also have a full line of stainless steel conveyor chains as well as hollow-pin conveyor roller chains. 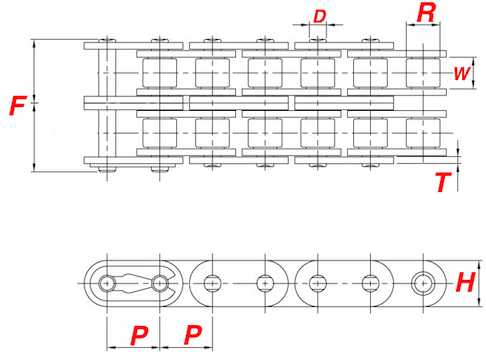 The most common style of conveyor chain is known as double pitch roller chain. This is because it conforms to ANSI B29.1 specifications and can retrofit most applications. It also offers a low weight to high-strength ratio, a long service life in most applications, and has a wide range of attachments available. There are two common styles of this chain. The first is the one shown in the picture above on the left, the second is the photo above on the right. The photo on the right is oversized-roller double pitch conveyor chain. This is used because the rollers extend past the side plates creating an easy way to convey content from one location to the next. These chains are typically designated with a 2 in place of the second 0 in the part numbers for these chains. Example, C2050 chain is the standard series and C2052 chain has the oversized rollers. Note: Most double pitch conveyor roller chains are stock in 10ft boxes, 50ft reels, and 100ft reels. Specific cut to length strands and attachments are availble upon request. 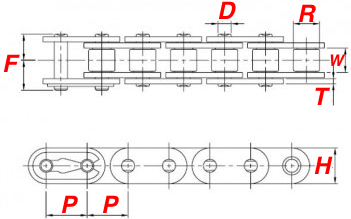 The next most common style of conveyor roller chain is known as the straight side plate or sidebar roller chain. This series fully match ANSI and ISO metric dimensionally with the exception of having straight side plates. Having straight side plates makes this roller chain have the ability to carry the product on top of it evenly. We also stock a full line of engineer class roller conveyor chains. The below chart only shows the most common sizes in the industry. To view, all sizes available go to our roller conveyor chain section. CC5 chain is the go-to conveyor roller chain for the automotive industry. Our CC5 chain is manufactured using high-quality heat treated steel components and we also offer a 304 and 316-grade stainless steel version of our CC5 chain. Overall Width Cottered (C2: 2.08"
Overall Width Riveted (C1) 2.00"